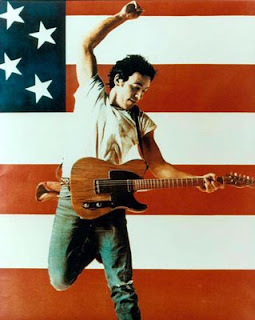 Never Mind The Mainstream on KUR (College Rock Radio): Happy Birthday, Bruce Springsteen! New Jersey's own Bruce Springsteen, The Boss, turned 60 today. Oh how we love him. "You've always got to remember, rock and roll's never been about giving up. For me, for a lot of kids, it was a totally positive force...not optimistic all the time, but positive. It was never--never--about surrender." And so I guess now is as good a time as ever to announce a new segment for our show: The Mighty Mighty Boss-Tune! (Clever, right?). We'll be playing a Springsteen song, EVERY SHOW, throughout the remainder of the semester. So that is definitely something to tune in for, along with our already significant line-up of great rock 'n' roll music. Here are some music videos in honor of one of the coolest dudes in rock music history. Bruce Springsteen - "Surprise, Surprise"